Listeriosis is an illness caused by the bacterium Listeria monocytogenes that is acquired by eating contaminated food. The organism can spread to the blood stream and central nervous system. In women who contract listeriosis while pregnant, the disease often causes miscarriage or stillbirth. Listeriosis is caused by an infection with the bacterium Listeria monocytogenes . These bacteria can be carried by many animals and birds, and they have been found in soil, water, sewage, and animal feed. Five out of every 100 people carry Listeria monocytogenes in their intestines. Listeriosis is considered a food-borne illness because most people are probably infected after eating food contaminated with Listeria monocytogenes . However, a woman can pass the bacteria to her baby during pregnancy. In addition, there have been a few cases where workers have developed Listeria skin infections by touching infected calves or poultry. In the 1980s, the United States government began taking measures to decrease the occurrence of listeriosis. Subsequently, processed meats and dairy products were tested for the presence of Listeria monocytogenes . The Food and Drug Administration (FDA) and the Food Safety and Inspection Service (FSIS) can legally prevent food from being shipped, or order food recalls, if they detect any Listeria bacteria. These inspections, in combination with the public education regarding the proper handling of uncooked foods, appear to be helping. Nonetheless, as of 2004, about 2,500 individuals become seriously ill from Listeria annually, with about 500 deaths. Persons at particular risk for listeriosis include the elderly, pregnant women, newborns, and those with a weakened immune system (called immunocompromised). Risk is increased when a person suffers from diseases such as AIDS , cancer , kidney disease, diabetes mellitus , or by the use of certain medications. Infection is most common in babies younger than one month old and adults over 60 years of age. Pregnant women account for 27 percent of the cases, and immunocompromised persons account for almost 70 percent. Persons with AIDS are 280 times more likely to get listeriosis than others. As noted, persons become infected with Listeria monocytogenes by eating contaminated food. Listeria has been found on raw vegetables, fish, poultry, raw (unpasteurized) milk, fresh meat, processed meat (such as deli meat, hot dogs, and canned meat), and certain soft cheeses. Listeriosis outbreaks in the United States since the 1980s have been linked to cole slaw, milk, Mexican-style cheese, undercooked hot dogs, undercooked chicken, and delicatessen foods. Unlike most other bacteria, Listeria monocytogenes does not stop growing when food is in the refrigerator; its growth is merely slowed. Fortunately, typical cooking temperatures and the pasteurization process do kill this bacteria. Listeria bacteria can pass through the wall of the intestines, and from there they can get into the blood stream. Once in the blood stream, they can be transported anywhere in the body but are commonly found the central nervous system (brain and spinal cord); and in pregnant women they are often found in the placenta (the organ which connects the baby's umbilical cord to the uterus). Listeria monocytogenes live inside specific white blood cells called macrophages. Inside macrophages, the bacteria can hide from immune responses and become inaccessible to certain antibiotics . Listeria bacteria are capable of multiplying within macrophages and then may spread to other macrophages. After people consume food contaminated with this bacteria, they may see symptoms of infection 11 to 70 days later. Most people do not get any noticeable symptoms. Scientists suspect that Listeria monocytogenes can cause upset stomach and intestinal problems just like other food-borne illnesses. Persons with listeriosis may develop flu-like symptoms such as fever , headache , nausea and vomiting , tiredness, and diarrhea . Pregnant women experience a mild, flu-like illness with fever, muscle aches, upset stomach, and intestinal problems. They recover, but the infection can cause miscarriage, premature labor, early rupture of the birth sac, and stillbirth. Half of the newborns infected with Listeria die from the illness. There are two types of listeriosis in the newborn baby: early-onset disease and late-onset disease. Earlyonset disease refers to a serious illness that is present at birth and usually causes the baby to be born prematurely. Babies infected during the pregnancy usually have a blood infection (sepsis) and may have a serious, whole body infection called granulomatosis infantisepticum. When a full-term baby becomes infected with Listeria during childbirth , that situation is called late-onset disease. Commonly, symptoms of late-onset listeriosis appear about two weeks after birth. Babies with late-term disease typically have meningitis (inflammation of the brain and spinal tissues); yet they have a better chance of surviving than those with early-onset disease. Listeria monocytogenes causes endocarditis in about 7.5 percent of the cases. Endocarditis is an inflammation of heart tissue due to the bacterial infection. Listerial endocarditis causes death in about half of the patients. Diseases which have been caused by Listeria monocytogenes include brain abscess, eye infection, hepatitis (liver disease), peritonitis (abdominal infection), lung infection, joint infection, arthritis, heart disease, bone infection, and gallbladder infection. The only way to diagnose listeriosis is to isolate Listeria monocytogenes from blood, cerebrospinal fluid, or stool. A sample of cerebrospinal fluid is removed from the spinal cord using a needle and syringe. This procedure is commonly called a spinal tap. The amniotic fluid (the fluid which bathes the unborn baby) may be tested in pregnant women with listeriosis. This sample is obtained by inserting a needle through the abdomen into the uterus and withdrawing fluid. 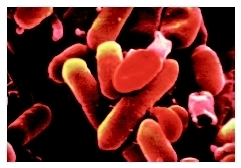 Listeria grows well in laboratory media, and test results can be available within a few days. Listeriosis is treated with the antibiotics ampicillin (Omnipen) or sulfamethoxazole-trimethoprim (Bactrim, Septra). Because the bacteria live within macrophage cells, treatment may be difficult, and the treatment periods may vary. Usually, pregnant women are treated for two weeks; newborns, two to three weeks; adults with mild disease, two to four weeks; persons with meningitis, three weeks; persons with brain abscesses, six weeks; and persons with endocarditis, four to six weeks. Scanning electron micrograph (SEM) scan of lysteria monocytogenes. The overall death rate for listeriosis is 26 percent. This high death rate is due to the serious illness suffered by newborns, the elderly, and immunocompromised persons. Healthy adults and older children have a low death rate. Complications of Listeria infection include: meningitis, sepsis, miscarriage, stillbirth, pneumonia , shock endocarditis, abscess (localized infection) formation, and eye inflammation. As of the early 2000s the United States government has done much to prevent listeriosis. Persons at extremely high risk (pregnant women, immunocompromised persons, etc.) must use extra caution. High risk persons should avoid soft cheeses, such as Mexican cheese, feta, Brie, Camembert, and blue cheese (cottage cheese is safe); thoroughly cook leftovers and ready-to-eat foods (such as hot-dogs); and avoid foods from the deli. Macrophage —A large white blood cell that engulfs and digests foreign invaders, such as bacteria and viruses, in an attempt to stop them from causing disease within the body. Baltimore, Robert S. " Listeria monocytogenes. " In Nelson Textbook of Pediatrics. Edited by Richard E. Behrman et al. Philadelphia: Saunders, 2004. Lorber, Bennet. " Listeria monocytogenes. " In Principles and Practice of Pediatric Infectious Diseases , 2nd ed. Edited by Sarah S. Long et al. St. Louis, MO: Elsevier, 2003. Goldenberg, R. L. "The infectious origins of stillbirth." American Journal of Obstetrics and Gynecology 189 September 2003): 861–873. Ressel, G. W. "CDC Issues recommendations for diagnosing, managing, and reporting foodborne illnesses." American Family Physician 86 (September 2004): 981–985. "Listeriosis." Centers for Disease Control. Available online at http://www.cdc.gov/ncidod/dbmd/diseaseinfo/listeriosis_g.htm#greatrisk (accessed January 7, 2005). My younger sister has this disorder and it is very sad to see her grow up with this disease. Now that I have read this article it helps me to understand more about my little sisters disorder. Thank you very much. I am 24 weeks pregnant and a few nights ago my husband gave me unpasturised milk by accident. I had 2 mouth fulls. Reading the article, I am afraid that I might develop listeriosis. What can I do to save my baby because I am really scared now of stillbirth.